Many Army divisions have over the years earned nicknames; some laudatory, some derogatory, but mostly colorful. Sometimes, the nicknames themselves have overshadowed the actual name of the division, e.g. the "Screaming Eagles" for the 101st Airborne Division. An official special designation is a "nickname granted to a military organization" which has been authorized by the Center of Military History and recognized through a certificate signed by the Secretary of the Army. it may defy accurate explanation (albeit not without numerous theories), such as the 9th Infantry Division, or "Old Reliables". Active divisions are listed in boldface; no distinction has been made between regular Army divisions and those of the Army Reserve or National Guard. The origin of the nickname is noted where possible. In some cases, the nickname was officially adopted by the division in question; this is indicated along with date of adoption (where known). Official status might also be inferred by the presence of the nickname on official distinctive unit insignia or in official military source materials. 13th Airborne Division – "Golden Unicorns"; taken from their shoulder patch, a winged unicorn in orange on an ultramarine blue, the branch of service colours of the United States Army Air Corps, was approved on 2 June 1943. A gold on black "Airborne" tab was worn above the insignia. 17th Airborne Division – "Golden Talon"; taken from their shoulder patch. 173rd Airborne Brigade – "Sky Soldiers"; They received their official nickname (Tien Bien translates to Sky Soldiers) from the Taiwanese locals during exercises when they were parachuting in Taiwan. The 173rd was part of the only major conventional airborne operation (Operation Junction City) during Vietnam War. 82nd Airborne Division – "America's Guard of Honor", "All-Americans"; original members of the division in 1917 came from every state in the Union. In addition, the 82nd Airborne has been called "Alcoholics Anonymous" in reference to the "AA" on its shoulder patch by members of other divisions. 101st Airborne Division – "The Screaming Eagles"; after their shoulder insignia, an American eagle's head on a black shield. During Vietnam, the nicknames "Puking Pigeons" and "One 'o Worst", a comment on their mode of transportation and a play on the official divisional name, were used. Both were used derogatorily by other soldiers, and were not used by the division itself. In addition, the Vietnamese called them the "Chicken Men" since they had never seen a bald eagle. Several regiments within the 101st were nicknamed "The Battered Bastards of Bastogne", due to their part in holding the important crossroads town during the Battle of the Bulge. 3rd Armored Division – "Spearhead"; in recognition of the division's role as the "spearhead" of many attacks during the liberation of France in 1944. "Breakthrough" – According to the Center of Military History, the 4th was "sometimes called the 'Breakthrough Division,' but the division never officially pursued the designation, preferring to be 'known by its deeds alone.'" 6th Armored Division – "Super Sixth"
7th Armored Division – "Lucky Seventh"
"Phantom"; so dubbed by the German army at the Battle of the Bulge  because, according to the United States Holocaust Memorial Museum, the division "seemed, like a phantom, to be everywhere along the front." "Remagen"; because the division captured intact the Ludendorf Bridge at Remagen, Germany; the first bridge across the Rhine River captured by the Allies. 10th Armored Division – "Tiger Division"; so named by Major General Paul Newgarden, the division's first commander, because a tiger has soldierly qualities, including being clean and neat and the ability to maneuver and surprise his prey. 11th Armored Division – "Thunderbolt"
12th Armored Division – "Hellcat Division" "Suicide Division" The Mystery Division"
13th Armored Division – "Black Cat"
14th Armored Division – "Liberators"; earned during the last days of World War II when it liberated some 200,000 Allied prisoners of war from German prison camps. 27th Armored Division – "Empire"; referring to the fact that it was a New York National Guard unit, after the state's nickname. 30th Armored Division – "Volunteers"; referring to the fact that it was a Tennessee National Guard unit, after the state's nickname. 40th Armored Division – "Grizzly"; referring to the fact that it was a California National Guard unit, after the state's nickname. 48th Armored Division – "Hurricane"
49th Armored Division – "Lone Star"; referring to its status as a Texas National Guard formation, after the state's nickname. 50th Armored Division – "Jersey Blues"; referring to the fact that it was a New Jersey National Guard unit. This is today's 50th Infantry Brigade Combat Team. 1st Cavalry Division — "The First Team" "Hell for Leather" (see: https://archive.org/details/gov.dod.dimoc.20366), "The Black Horse"
"The Big Red One" of the 1st Infantry Division. 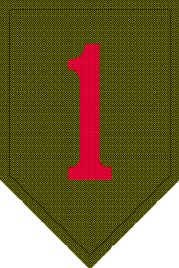 "The Big Red One" – from the division's official shoulder patch: Red numeral "1" on an olive drab shield. "Indian Head" – Official as of 1948. From the shoulder patch: an Indian head on a white star superimposed on black shield. "Rock of the Marne" and "Marne Men" – earned for the Battle of the Marne during World War I, when the division held its position and repulsed two German divisions. "Blue and White Devils" (German: "blau-weiße Teufel") – during the Battle of Anzio during World War II, the division was called this nickname by their German opponents, based on their shoulder patch (a square containing three diagonal white stripes on a dark blue field). "Broken Television" - from their shoulder patch resembling a television with static on screen. "Ivy" – play on the Roman numeral "IV" ("4"). Also, ivy leaves are symbolic of tenacity and fidelity, the basis of the division's motto, "Steadfast and Loyal". "Lost Lieutenants" or "4 Lieutenants Pointing North" - a play on the division shoulder sleeve insignia and the stereotype of 2nd Lieutenants being inexperienced and unskilled. "Red Devils" – during the Battle of Saint-Mihiel in World War I, the Germans referred to the division as "Die roten Teufel" (German, "The Red Devils"). "Bayonet Division" – this nickname "became synonymous with the division through its participation in the Korean War and symbolizes the fighting spirit of the men of the 7th Infantry division." "H-Hour" – Shoulder patch: Red circular patch bearing black hour glass which is formed by an inverted "7" and a superimposed "7". "Golden Arrow" – Official as of 1948. Shoulder patch: An upward pointing gold arrow piercing a silver figure "8" on a blue shield. "Pathfinder Division" – Official; original nickname (supplanted by "Golden Arrow" and later reinstated), so named in honor of John C. Fremont, an explorer of California, the namesake of Camp Fremont, which is where the division was formed. "Psychedelic Cookie" - Used during the Vietnam War in reference to its shoulder patch. "Americal" - At one point in time this was the official Divisional designation, when it was redesignated as the 23rd Infantry Division, Americal became the divisional nickname. Originally formed in World War II out of separate American National Guard units on the island of New Caledonia, hence the origin of the name. "Tropic Lightning" – Official (adopted August 3, 1953). In 1942 the division was ordered to deploy to Guadalcanal to relieve U.S. Marines there; only 31 days were required to accomplish the mission and earned the division its official designation. The Division patch is a taro leaf (indicating Hawaii, where the division was formed), and a lightning bolt, "representative of the manner in which the Division performs its allotted assignments." "Electric Strawberry" - so called because the shoulder patch taro leaf resembles a strawberry with a lightning bolt on it. 26th Infantry Division — "Yankee"; This is today's 26th Maneuver Enhancement Brigade. 27th Infantry Division — "Empire," a legacy of the 27th Armored Division. "O'Ryan's Roughnecks," a reference to the first division commander, John F. O'Ryan. "New York Division." - Many members were part of the New York National Guard. The abbreviation N.Y.D. can be seen in the division shoulder sleeve insignia. The insignia also contains an "O" for O'Ryan, as well as a depiction of the Orion constellation as a pun on O'Ryan's name. This is today's 27th Infantry Brigade Combat Team. "Keystone" – The badge is a red keystone; the division was formed in Pennsylvania, the "Keystone State"
"Bloody Bucket" - So called by German soldiers in World War I and World War II because the keystone shaped patch was red and resembled a bucket. "Blue and Gray" – In 1919, when shoulder sleeve insignia were first authorized, the division consisted of two masses of men, one from the North (represented by blue) and the other from the South (represented by gray). 30th Infantry Division — "Old Hickory"; This is today's 30th Heavy Brigade Combat Team. "Red Arrow"; "shot through a line denoting that it pierced every battle line it ever faced"; This is today's 32nd Infantry Brigade Combat Team. "Golden Cross" - take from the design of the insignia, used as the title of the World War II history. This is today's 33rd Infantry Brigade Combat Team. "Red Bull" – The badge is a red bull's skull on a black background. "Arrowhead" – Official depicting insignia. "Texas" – The division is based in Texas. "Lone Star" – Texas is the "Lone Star State". "Buckeye"; This is today's 37th Infantry Brigade Combat Team. "Cyclone" – official. Named after a tornado hit the camp where the division was training prior to deployment during World War I. "The Avengers of Bataan" This is today's 38th Sustainment Brigade. "Sunburst" – the badge is a gold sunburst on a blue background. "Ball of Fire" - Nickname adopted during its deployment to Korea. "Flaming Assholes" - The unofficial nickname came from the Korean War era when the unit was training in Japan. It was a combined result of disparaging remarks made by Army regulars about the National Guard division and the appearance of the unit shoulder sleeve insignia. The California Guardsmen took to their new nickname with a soldier's sense of humor, and turned it into a rallying symbol (sometimes used for the 9th Infantry Division, due to the appearance of that division's shoulder sleeve insignia). "Sunset" - Unit patch has a half sun represents the setting sun on the Pacific. Often humorously referred to as the "Days Inn Patch" or "Thirteen Lieutenants Pointing North", this is today's 41st Infantry Brigade Combat Team. 42nd Infantry Division — "Rainbow"
45th Infantry Division — "Thunderbird" – official nickname; This is today's 45th Infantry Brigade Combat Team. 47th Infantry Division — "Viking" – a unit of the Minnesota Army National Guard. 63rd Infantry Division — "Blood and fire"; This is today's 63rd Regional Support Command. "Fightin' 69th" – official nickname; earned after breaking through the Siegfried Line in 1945. "Three B's" - nickname adopted during training. Humorous reference to the division's dislike of frequent bivouacking ordered by their original Commander, Charles L. Bolte. 77th Infantry Division — "Metropolitan" or "Liberty"; This is today's 77th Sustainment Brigade. 80th Infantry Division — "Blue Ridge"; This is today's 80th Training Command. 81st Infantry Division — "Wildcat"; This is today's 81st Regional Support Command. 84th Infantry Division — "Railsplitters"; This is today's 84th Training Command. 85th Infantry Division — "Custer"; This is today's 85th Support Command. 87th Infantry Division — "Golden Acorn"; This is today's 87th Support Command. "8 Across and 8 Up!" – A play on military slang, insinuating that the quality of the division is low; This is today's 88th Regional Support Command. 90th Infantry Division — "Tough 'Ombres" – Due to the members of the division being from the Texas-Oklahoma area, close to Mexico. "Buffalo" – a racially segregated African-American formation, named for the famed Buffalo Soldiers of the late 1800s. "Red Hand"; "Adrians"; "Blue Helmets"
"Iron Men of Metz" -from the siege of the town of Metz in eastern France during World War II. 99th Infantry Division — "Checkerboard"; This is today's 99th Regional Support Command. 106th Infantry Division — "Golden Lion"
^ "Special Designations". United States Army Center of Military History. ^ "82d Airborne". World War II European Theatre of Operations: Divisions. The Army Almanac: A Book of Facts Concerning the Army of the United States. U.S. Government Printing Office. 1950.